Menulog delivers for The Hive Bar so you'll be able to track your courier on a map. 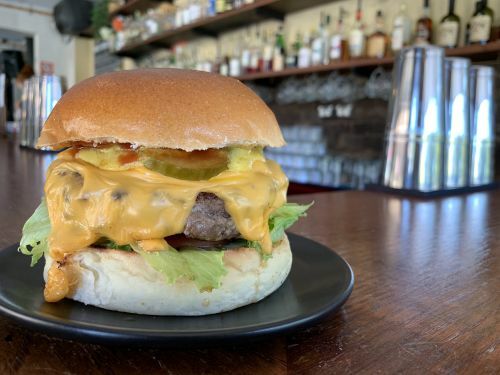 100g grass-fed beef, jack cheese, pickles, onion, mustard and tomato sauce on a soft milk bun. Pea and edamame patty, vegan cheese, creamy chipotle and tomato chutney on a soft white bun. Kangaroo patty, blue cheese, pickles, red onion and chilli sauce on a soft milk bun. 100g beef burger with bacon, mushrooms, Swiss cheese, pickles, chilli aioli, tomato sauce and American mustard on a soft milk bun. Black bean and beetroot patty with almond feta, tomato, mixed leaves, red onion pickles and chilli sauce. Served on a soft white bun. Vegan pulled pork marinated in sweet and sour chilli with mayo, avocado, coleslaw and a crispy pineapple fritter. Marinated vegan chicken patty with vegan bacon, avocado, lettuce and BBQ sauce. Served on a soft white roll. Marinated and crispy vegan chicken patty with avocado, coleslaw and chilli aioli. Served on a soft white bun. 200g grass-fed beef patty with lettuce, tomato, onion, pickles, jack cheese, tomato sauce and mustard. Served on a soft milk bun. 200g grgrass-fed beef patty with bacon, beetroot, tomato, jack cheese, tomato chutney, pickles, mustard aioli and mixed leaves. Served on a soft milk bun. Hot chips with vegan cheese and gravy. Served on a soft white roll. Handcrafted, triple fried and served with garlic aioli. Our famous deep fried pickles, served with chilli mayo. Hot chips with chilli salt, covered in melted cheese, chilli sauce and topped with smashed avocado. Fried and served with chilli BBQ sauce. Marinated vegan chicken mince coated in crispy batter and deep fried. Homemade jalapeno pickles battered and stuffed with housemade almond feta and deep fried. Tomato, cucumber, capsicum, mixed leaves, house pickles, red onions and Kalamata olives. Lightly dressed and topped with housemade almond feta. Black bean, corn, quinoa, cherry tomato, avocado, red onion, coriander and mixed leaves. Served with garlic and lime dressing. Hot chips with vegan cheese and porcini gravy.